(5) Ribbon to Ribbon Connector Ribbon Star Doublewide NEW! 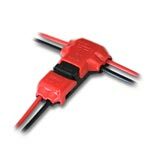 Use this connector to make an electrical connection between two separate pieces of our 16mm wide Ribbon Star Doublewide strip lights. To use simply pull out the plastic tab, insert the strip light and then pinch back into place. Sold in sets of 5, compatible with our single color indoor strips with 16mm wide PC board. The Ribbon Star Doublewide, White flexible LED Strip Light is basically two rolls of LED Strip combined into one. With twice the amount of LEDs and a wider PC board the doublewide led strip has a broader beam angle as well as higher lumen output than a mid-level strip light. 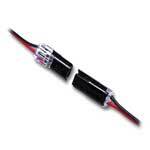 The 24VDC power input allows for longer serial connections with less voltage drop, 30ft max. This 118" (3m) ribbon has one soldered lead and comes with two quick connectors to bare lead wires. Comes with 3M™ VHB™ mounting tape on the back, for the best long-term mounting solution. 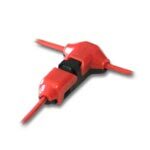 Cut lines per 1.96" make this product suitable for any project length. 12 SMD LEDs per 1.96". Consuming only 5.4W of power per foot this is a great low energy and eco friendly lighting product. Great for use under cabinets, ceiling coves, toe kicks, above cabinet lighting, accent lighting, display lighting, signage lighting or any other lighting project requiring a bright and long lasting light. 6000-6500K color temperature, for dry indoor use only. CE and RoHS approved. The Ribbon Star Doublewide, Warm White flexible LED Strip Light is basically two rolls of LED Strip combined into one. With twice the amount of LEDs and a wider PC board the doublewide led strip has a broader beam angle as well as higher lumen output than a mid-level strip light. 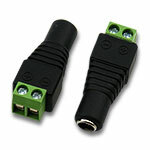 The 24VDC power input allows for longer serial connections with less voltage drop, 30ft max. This 118" (3m) ribbon has one soldered lead and comes with two quick connectors to bare lead wires. Comes with 3M™ VHB™ mounting tape on the back, for the best long-term mounting solution. 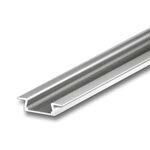 Cut lines per 1.96" make this product suitable for any project length. 12 SMD LEDs per 1.96". 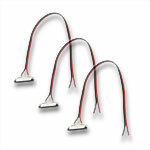 Consuming only 5.4W of power per foot this is a great low energy and eco friendly lighting product. Great for use under cabinets, ceiling coves, toe kicks, above cabinet lighting, accent lighting, display lighting, signage lighting or any other lighting project requiring a bright and long lasting light. 3000-3500K color temperature, for dry indoor use only. CE and RoHS approved.